Beautiful Christmas fairy light design ideas are essential to a cosy festive atmosphere, with even the simplest string of fairy lights adding ambience to a room. But Christmas isn't the time to hold back on decorating, so why not mix and match two or three (or more?) different fairy light designs? 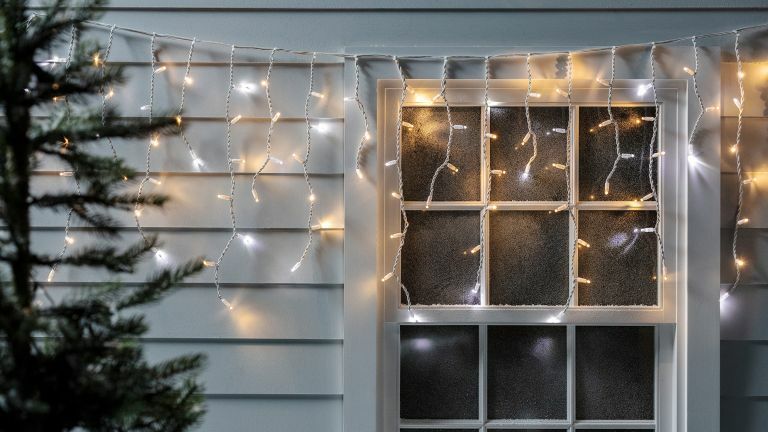 Plus, there's the exterior of your home home to think about... We've gathered glittering array of festive fairy light design ideas to suit all tastes and decors, from minimalist to opulent. For more Christmas ideas, go to our dedicated page. Copper wiring adds lovely warmth to a string of festive fairy lights – perfect for warming up a room visually. Hang yours up or make a display with them in a jar or vase. Our favourite is the softly glowing 100 LED Star Copper Wire in Warm White from B&Q. To add festive interest to a neutral or minimalist decor, play around with a variety of shapes and sizes; string them over the door to your living room to create an unusual (and inviting) display. We love this year's Christmas light assortment from The White Company. Clusters of fairy lights look especially magical when used to decorate a conservatory, hallway, or dining room. The myriad reflections in the windows will multiply the shimmering effect. Three-dimensional star clusters are especially attractive, since they will send out light in all directions. These Starburst Led Hanging Lights from Annabel James are warm and delicate – a festive must. Love decorating your tree with candy sticks? Match up your fairy lights. Gone all out on tree decs? Choose fun fairy lights, too. Our favourites are the Candy Cane fairy lights by Lights4Fun (above) and the very sweet Festive Mini Tree Shaped String Lights from Ginger Ray (below). A perfect Christmas addition to a contemporary home design scheme. For a touch of vintage elegance, opt for a heavier, more substantial fairy light garland; you can then arrange it along your mantlepiece or bookcase for a relaxed, boho feel. These Jewel String Lights are from House of Bath. You can't beat gold for creating an atmosphere of festive well-being, and it is no wonder that there are endless gold fairy light design ideas on the market. Our gold favourites are the Ora golden LED lights, £39.95, Annabel James (above) and this year's Christmas lights from Marks and Spencer (below). Botanical-themed fairy lights work particularly well as part of the festive table arrangement. Intertwine them with real house plants, or choose ones that imitate Christmas favourites such as holly. The Rose Gold Leaf Fairy Lights (above) and Holly Micro Fairy Lights (below) are both from Lights4fun. Tired of plain fairy light design ideas? This could be the year to go for colour; our advice is to pick a string with no more than two or three complementary colours, or go for really tiny ones if you like a rainbow effect. The Colour Changing Mini Ball Lights (above) and Led Timer Lights (below) are both available at B&Q. Not all Christmas schemes have to be gold, green, and red – if you prefer recreating a white Christmas in your home, then go for fairy lights that are cool rather than warm. The Iridescent Ice Cube Micro Fairy Lights from Lights4fun are cheerful despite looking, well, like ice, and are guaranteed to make up for the likely lack of real snow and ice on Christmas Day. One of the best things about Christmas is added light from people's house decorations – and, boy, do we need all the extra light we can grab during at time of year. Go as understated – or OTT – as you like, it's all part of the Christmas spirit! We love this Penguin light by Lights4Fun (above) and the classic Christmas lights ensemble from Dobbies (below) – perfect for warming up the pitch-black nights. For an understated wintry glow, try mixing and matching warm and cool string lights. We like the Pro Series Sparkling Icicle Lights from Lights4fun. Have all the traditional fairy lights you could possible want? Or just feeling the itch to change things up a bit this year? Embrace the kitsch decorating trend – which basically means that anything goes. For example, how about Lobster Fairy Lights from Hurn & Hurn? They're still quite festive thanks to their ruby-red colour, and they're guaranteed to elicit at least a chuckle (or a shriek, if they're sensitive) from your Christmas dinner guests. With tiny LEDs our rule is: the more the better. And rather than getting tangled up in lots of different strings of lights, get a garland that is designed to be used as a cascade. We love the warm glow of the 400 Warm White LED Cascading Christmas Lights by Hurn & Hurn. You don't always need the brightest lights to create a festive effect. Go for a gently glowing, retro design in different colours, and enjoy as part of a cosy, easy-going decorating scheme. These 10 Multi Coloured LED Retro Christmas Fairy Lights are by Lights4fun.